Forty years ago this summer, I started working at a Salvation Army Camp in Western Pennsylvania. 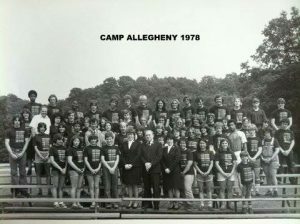 Camp Allegheny, primarily served 2000 marginalized children and youth from urban and rural areas in Western Pennsylvania wherever the Salvation Army was present. I had just returned from serving in the United States Navy. So at 19, I was the oldest Junior Counselor on staff and served in cabin 11. It was the summer God broke my heart through a little boy affectionately called “Spider Monkey” by my 15 other campers during a session of Community Service camp in July 1976. Spider was very small, for a 9 year old boy, with legs and arms as thin as twigs and not much muscle. Camp Allegheny was very hilly with the younger boys cabins up on a laneway midway up to the meadow, a row of cabins for olders boys on an upper laneway facing the meadow, and a row of cabins for girls at the opposite end of the camp on a lower laneway along the Slippery Rock Creek. The dining hall, offices, tabernacle, basketball courts and picnic grove were located at the base of the boys hill and the arts and crafts building, infirmary, swimming pool and boating were located at the lower opposite side of camp from the boys cabins and closer to the girls cabins. Each morning, the announcement of rise and shine would be broadcasted loudly over all the camp and I am sure residents in the entire valley appreciated it all summer long. Spider would try his best to keep up with the stronger boys but would always experience fatigue early on from going down the hills and up the hills, playing and climbing. He loved camp! I can always see his little face looking up at mine when he could no longer walk and he would say, “Carry me Mr. Tim!” so I would lift his little body up on my shoulders and carry him so he could keep up with the rest of my other boys all day long. “Don’t fail to do something just because you can’t do everything.” I couldn’t solve all of Spider’s issues in a week at camp but I could carry him when he had no more strength. Is there something you can do for someone today? I couldn’t find my first camp staff photo, this was my third summer at Camp Allegheny!